The purpose of this lab is to provide a more advanced understanding of Cisco’s ASA 5520 Adaptive Security Appliance; The Cisco ASA is a security device that combines firewall, antivirus, intrusion prevention, and virtual private network (VPN) capabilities. In this lab we will Packet Tracer 6.1 to learn how to configure the ASA as a basic Firewall with the addition of a third zone referred to as a DMZ. This knowledge is essential to passing the CCNA Security exam and will be used in daily in your position as a Cisco network engineer. 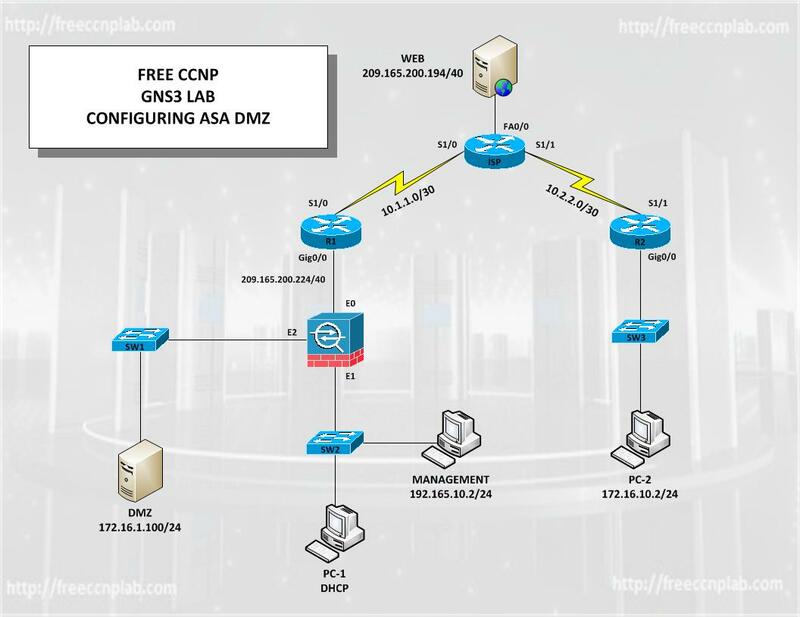 In this lab we will use GNS3 to construct a small network using the ASA 5520, which will be separated into three zones Outside, Inside, and DMZ. We will learn to how to add an ASA to GNS3, install and use Cisco’s ASDM. The outside interface is a public untrusted zone commonly used to connect to public address within the internet. Devices within this zone cannot access devices in the inside or DMZ without permission. The inside interface is a private trusted interface generally used for local devices using a private address space. To access public address in the outside the private address will need to be translated using NAT or PAT. Device can access devices in the outside or DMZ unless restricted. In computer security, a DMZ or demilitarized zone (sometimes referred to as a perimeter network) is a physical or logical sub network that contains and exposes an organization’s external-facing services to a larger and untrusted network, usually the Internet. The purpose of a DMZ is to add an additional layer of security to an organization’s local area network (LAN); an external attacker only has direct access to equipment in the DMZ, rather than any other part of the network. Handy troubleshooting features and powerful debugging tools such as packet trace and packet capture. Add the ASA to GNS3. Use ASDM to configure the ASA. When this process is finished, the ASA will write the ASDM image and you will be presented with the prompt where you left off.